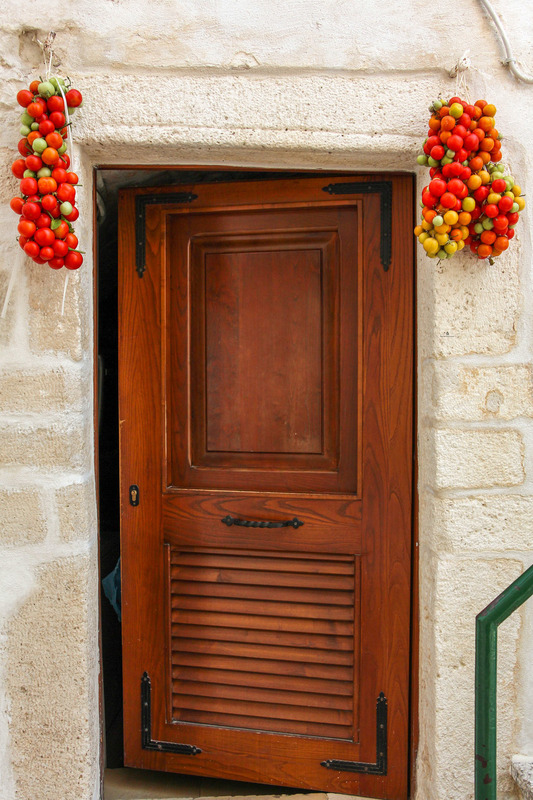 After our short but sweet stay in Alberobello we headed further south, to Lecce. The weather was extremely hot, after all, it was July, and the biggest part of the day was ruled out for sightseeing. That's why we didn't stop at Locorotondo, Martina Franca or Cisternino, all lovely little places (at least that's what I've read about them), on our way to Lecce. 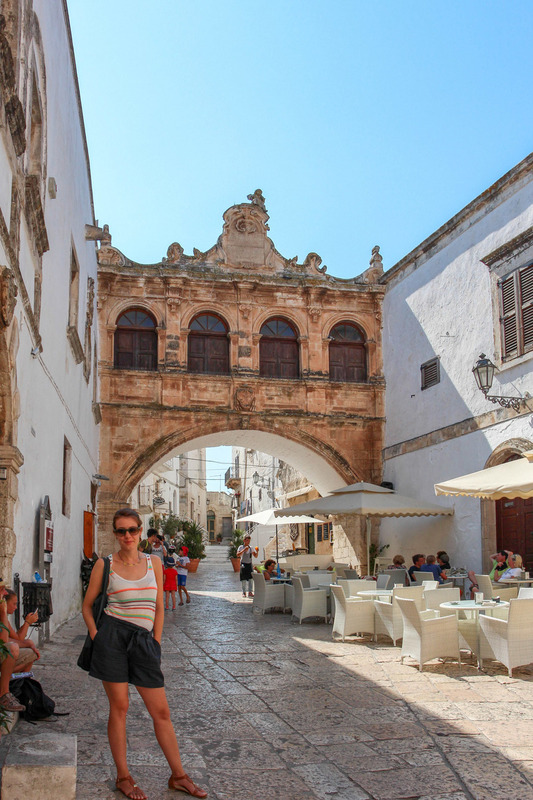 We did stop at Ostuni, the so called "White Town" as we were hungry and exhausted from the drive in a glowing car (the Air Conditioning could barely tone down the heat). It is a pity that the heat was unbearable and that we were too tired and a bit lost when we started searching for the city center and a place to eat. When we ultimately found the center, we also found a place to sit, it was a colorful and hip bar called Evo, which had good sendwiches and excellent smoothies and cakes. A bit refreshed, we took a walk through the old part of the town. It is a hilltop town with narrow cobbled streets, white washed houses and some beautiful architectural pieces. I can imagine it beeing especially charming at dawn and evening, when the streets come to life with its restaurants, bars and shops, and the white washed houses start to glow in the night. However, we left Ostuni for some other time, and headed to Lecce. Lecce was kind of a dissapointment for both of us. 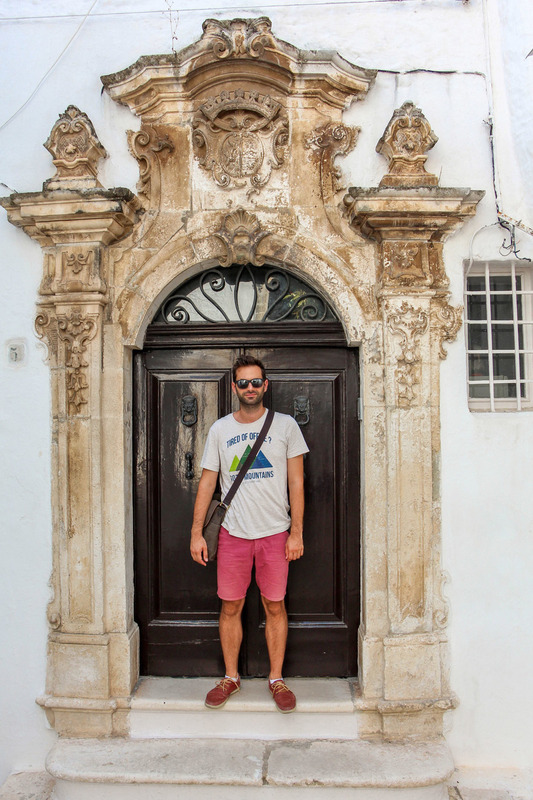 I even thought of skipping the post about it on the blog, but since I'm doing a series on this Puglia and Basilicata road trip, it wouldn't make sense, and also everything can't always be beautiful or charming or lovely. Just like sometimes everything clicks perfectly in some places in the right moment, it happened just the opposite for us in Lecce. I cannot say that it is not a pretty town, after all it is the finest example of a baroque town, sometimes even called "the Florence of the South". But, as I said in one of my previous posts, "it may take only one rainy day or lousy restaurant to take the magic away", and so it happened in Lecce. During the day, the streets were completely empty, here and there, you'd catch a glimpse of a lost group of tourists wandering around slowly under the burning sun. In the evening, it seemed like everyone- all the tourists and all the locals poured out from their daytime shelters, to catch a little breeze on the evening passegiata, and we found the streets too crowded for a relaxed walk. Although the streets were crowded and we were surrounded by amazing baroque architecture, we couldn't find that liveliness, charm, and beauty of the Italian town, it simply wasn't what we expected. Now that I think about it, we could give Lecce another shot! However, we were longing to move forward, to our next destination, which turned out to be a highlight of our trip- the wonderful Matera. I can't wait to share my photos and experiences of this special place in my next post.